The complexity of wastewater systems in today’s cities is beyond the imagination of most of us who have never descended into the scary tunnels that lie beneath our streets. And many wastewater workers deserve to be considered heroes just for the performance of their daily duties. A Denver Post story describes a recent incident in which Denver wastewater worker Gary Valerio crawled into a 42-inch-diameter tunnel through deepening muck and muscled out two 150-pound concrete chunks. The concrete was discovered by robot cameras which routinely crawl through the massive sewer system, snaking through dark and difficult passages in a procedure that the Post compares with a colonoscopy. The robot examining the dark passages under Denver’s streets discovered two massive blocks of concrete, a certain source of a major sewer blockage if not removed. The concrete chunks — apparently construction debris — couldn’t be dislodged using high-pressure washing. These were the largest obstructions supervisors said they’d seen. Sewer debris — toilet paper, rags, orange peels, cigarette butts — was amassing rapidly behind each chunk. 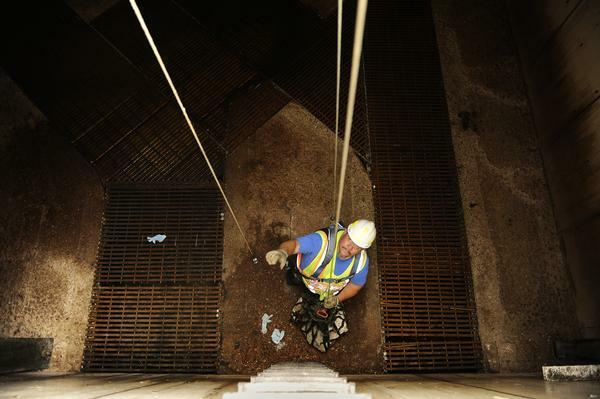 Mr. Valerio climbed down a manhole about 12 feet and lifted a grate to expose whooshing greenish-brown wastewater. He entered at 4 a.m., when the level was relatively low and after much effort managed to crawl 140 feet into a 150 foot tunnel to finally secure the blocks on a makeshift wagon so they could be pulled from the tunnel. The wastewater system of Denver is not unlike that a many large cities. The wastewater produced by 1.7 million metro Denver residents has reached 130 million gallons a day. Sewer lines in seven metro counties overflowed 282 times during the past five years, including seven spills of more than 100,000 gallons, according to state records. While 60 percent of the spills released less than 1,000 gallons, an obstruction as small as a tricycle quickly can block wastewater and send sewage into homes and burbling out manholes into neighborhoods. A national $500 billion burden looms as tightening federal standards compel cities to do a better job of dealing with wastewater. This is a difficult situation at best at a time when cities are struggling to keep their finances in the black. Metro Wastewater managers responsible for treating Denver-area sewage say they must spend $1.6 billion over the next 10 years — to install technology that removes ammonia and nitrates before wastewater is discharged into the South Platte River. Up to 85 percent of South Platte water downriver from Denver is made up of treated wastewater. The wastewater flows through the more than 3,500 miles of sewer tunnels from homes across 715 square miles to the treatment plant north of downtown. See the Denver Post for more details.